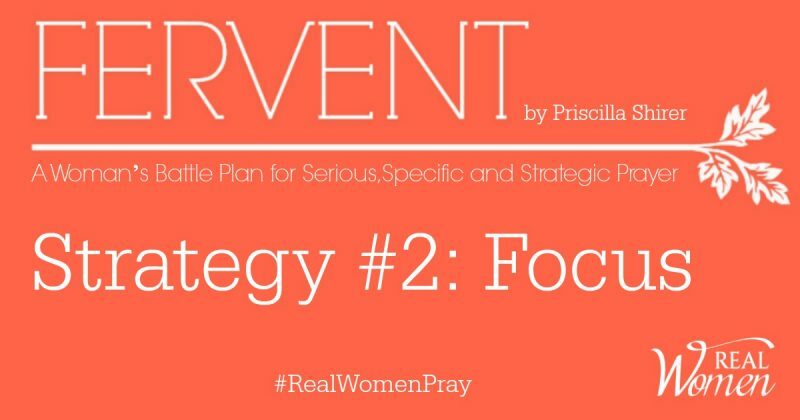 This post is part of the #RealWomenPray online Bible study series: “Fervent: A Woman’s Battle Plan for Serious, Specific, Strategic Prayer” by Priscilla Shirer. To get information on the next Bible study, visit Bible Study. To be notified when registration opens for the next study, click here. Our real enemy is not our spouse, our children, our boss, our friends, or other church members. Our real enemy is satan. If the enemy can misdirect our focus onto the people or circumstances around us as the source of our struggle, rather than clearly identifying him as the source of our problems, he can keep us distracted from our goals and purpose by keeping us fighting against them rather than against him. Even when we must face those consequences, God can use hard times to draw us closer to Himself. At other times, the enemy can attack and use it to draw us away from our relationships, stirring up discord in our home, work, or church. 1: Sometimes bad things happen, even to good people. 2: Sometimes we chose behaviors that aren’t the best and we have to face those consequences. In both circumstances, God can still use these to draw us closer to Him. But in those times when we do face spiritual battles, we must use spiritual weapons to fight. What are the weapons we can use to keep our focus and fight our real enemy? Truth—God’s standard. This is how we should measure everything in our lives. Righteousness—The process by which we apply God’s truth to our lives. Living rightly (making sound decisions) in accordance to God’s standard is using His Word to guide or lives everyday. His truth becomes our reality. Faith—Applying what you believe. Stand firm in God’s truth and do not be moved by the circumstances around us. Salvation—This is the most important weapon to have. Without salvation we can not stand. We must be His child first and foremost. The Word of God—This is how we know what He wants for our lives. We can only know God’s truth through reading His Word and believing (faith) in His promises. We should apply His truth to our everyday choices. Use these questions in your quiet time or feel free to comment below. Identify any area(s) where you are facing struggles. Have you been distracted into thinking your issue(s) are with someone or something else? Beside each situation you identified write down any person or thing that you have felt was the main cause of the struggle. Use this list to help you write your prayer strategy. Are there any pieces of armor from Ephesians 6:10-18 you need help “sharpening”? List them out and use them to write a prayer asking God to help you in those areas. Ask God to expose the enemy’s lies in your situation. Ask Him to give you clear focus, or to re-focus, on the real issues. Pray specific . Get real with yourself and God. Pray for what is going on in your life – specifically. Address the need head-on. An example would be if your marriage is being attacked. Don’t pray “Lord, please bless my marriage…”. BE SPECIFIC. Is the issue unfaithfulness? Hurt feelings? Arguments over finances? Feelings of being unloved or unappreciated? Pray specifically for those situations. God already knows it anyway; it is not a secret. Get real and pray fervently! Father, thank you for giving us spiritual weapons to fight the spiritual attacks against us and our family. But, Lord, forgive us when we have taken our focus off of you and began to fight our own battles, waging war against those we love the most. Father, we ask You to help us re-focus our attention to the real enemy. Give us discernment to his lies in the areas where we struggle. Give us courage to stand firm in the promises of Your Word as we fight through our prayers. Jesus, give us patience so we may have peace knowing You are working on our behalf. Thank You, Jesus, for helping us to stand firm. We pray and believe Your truth over our situations. In Jesus’ name, Amen.